Showcase your luxury properties and your distinguished service with a complementary suite of personalized Carriage Trade listing kits, social media assets, post cards, signage and more. 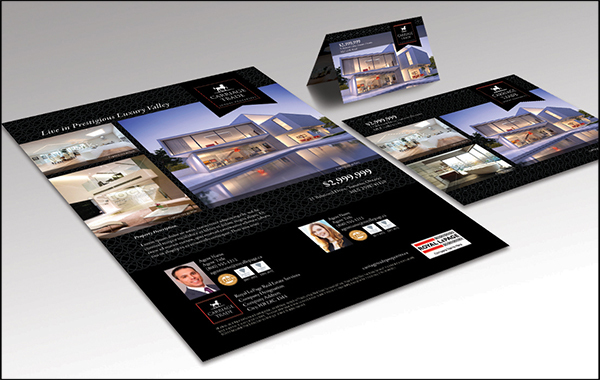 Each template is specially designed to appeal to the most discerning luxury clients with a sophisticated aesthetic. Listing kits templates are conveniently pre-populated with your listing photos and property information, and can be created in minutes. Create your own today! Log in to Smart Studio and visit the Studio to select any of the Carriage trade templates. These design templates will auto-populate you’re your listing data. Available in the Smart Studio, the single property website is beautifully presented and easy to create with integrated listings data. This custom-designed listing tool will surely help set you apart from the competition. To use the auto-populated listing data feature, simply select the Carriage Trade designed single property website from the Design Studio and follow the steps to customize. Questions? Contact Customer Care at 1.877.757.4545 or help@royallepage.ca.